‘99% Halal’ play – Where are your boundaries…? FOR MOST young people (and beyond) relationships are the trickiest of life’s rich and varied challenges. In South Asian communities managing the expectations of parents and other close relatives can present further complications and obstacles to an already fraught arena. A new work by emerging playwright Shazia Ashraf looks to explore this in the context of second and third generation South Asian Britons in “99% Halal”, which opens tomorrow (December 17) in Bradford. The play centres around two characters who are preparing to get married and there is a good deal about social media and how it impacts on relationships. There is a strong, multi-media element to the play, which is aimed at a 16+ age audience, is set in the present and is about 90 minutes long. In many ways, Ashraf wants to deal with the here and now of love and meeting a potential partner and how they are managed by British Muslims/South Asians. For her, it’s important to show second and third generation Muslims and South Asians on stage. Ashraf spent time in Bradford talking to different people and noticed some changes within communities. The phrase ‘Haram (meaning forbidden in Islam) relationships’ comes up and it’s clear that dating and having girlfriends/boyfriends can be an area of contention. Ashraf is keen to explore the identities and beliefs of what she calls the ‘Shisha bar generation’ – those who socialise extensively and go out all night. She also hinted that one of the characters has a significant online presence. So, there are a number of rich themes and it asks questions of all of us about society and how young people are coping with those particular pressures. There will be music and dance, with these arrangements done by DJ Shai Guy (Shai Hussain of Bombay Funkadelic and BBC writers’ room – a group developing BBC content). She stressed that she is not coming down on one side or another or taking a distinct stand. “I’d like to let audiences decide for themselves,” she emphasised. 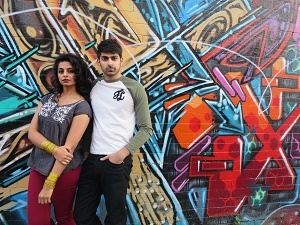 Ashraf enjoyed success in 2013 with “Peacocks”, a play loosely inspired by Shakespeare’s “Othello” but set in contemporary Bradford with characters inspired by the Mughal period. A director too, she set up the ‘My Big Phat Writing Group’ up in the town nearly five years ago, and hopes that “99% Halal” will get a longer and more geographically spread run in 2016. Hannah Baxter-Gale is the technical manager and Uzma Kazi is responsible for the stage. The play’s videographer is Sid Akbar Ali. “99% Halal” is Arts Council funded. Hi, neat internet site you have got right now. Good site you’ve got in here. Hello there, tidy web page you’ve right now.